If your kids love water sports, they’re sure to love stand-up paddleboarding. A favorite among East Hampton locals, it involves standing atop a surfboard and using a paddle to cruise through the waters. Going to the beach isn’t the only way to cool down in the Hamptons. For a refreshingly sweet alternative, head over to Bridgehampton Candy Kitchen where kids can sample gourmet ice cream flavors such black raspberry and banana. The East Hampton Library is the kind of library that kids won’t mind visiting every day. After all, there are LEGO clubs, music programs, and other fun activities held here most days of the week. Summer is the height of berry-picking season, and you and your kids can pick a fresh batch at any of the berry farms in the area in the East End. Every Tuesday in East Hampton, Kama Deva Yoga hosts yoga classes for five- to seven-year olds. Classes are done before bedtime, so kids can practice poses in their jammies. If your kids are animal lovers, take them to the duck pond on David’s Lane in East Hampton. Pro-tip: ducks love good, old-fashioned cracked corn. There’s always something to explore and learn at the Children’s Museum. Exhibits range from the historical (the Hamptons’ naval history) to the fascinating (how potato chips are made). The Hamptons is teeming with natural wonders, and one of the best places to experience them is on this kid-friendly trail at Mashomack Preserve on Shelter Islands. 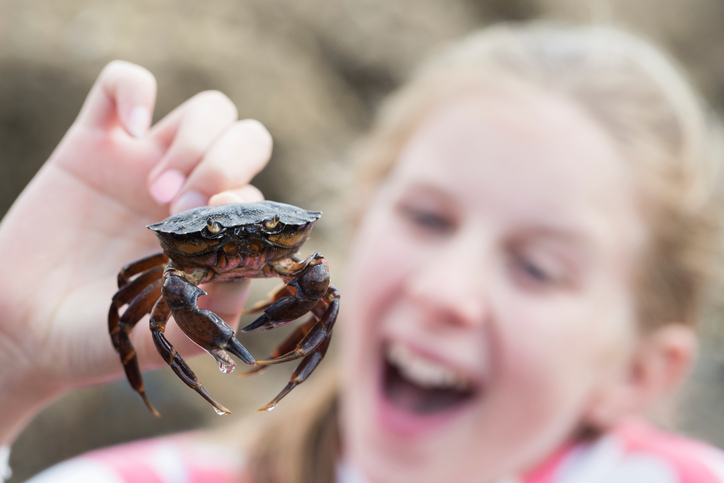 The best crab is always freshly caught, and young ones can catch their fill at Sagaponack and Georgica Ponds in Southampton. Even better, you can get all the equipment and supplies you need at the local hardware shops there. Baiting Hollow Farm Vineyard in Southampton is a win-win choice for both parents and tykes. For you, there’s a wide selection of wines to sample; for them, there’s an equestrian facility where children they can go horse riding. Play a few games at a local stadium. You can also buy tickets to watch the Hamptons Collegiate Baseball League in sports venues across the Hamptons. The only thing better than watching cartoons on TV? Seeing colorful characters doing fun antics in real life at Goat in a Boat Puppet Theater on Sag Harbor. Let your kids discover the rustic charm of farm living at this unique Amagansett attraction. It lets young ones take part in running a farm, including performing kid-appropriate chores. Trains have always been an object of fascination for kids. And at this Greenport museum, they can learn everything about this pioneer of modern transportation. Time for some adventure on the high seas! In Montauk, book a schooner for your family and get a chance to witness whales in their natural habitat. Want to live in this kid-friendly area? Browse the site for property options. For inquiries, call Kerrigan County Realty at 631.288.9600 or send an email to broker(at)kerriganrealty(dotted)com.